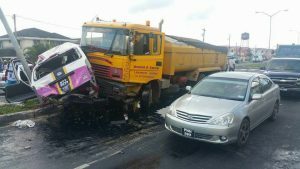 Several persons were Saturday morning hurt in an accident involving a truck and a minibus on the East Bank Demerara Public Road. 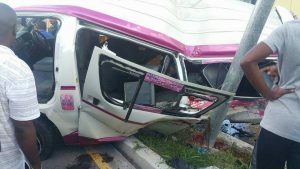 The truck slammed a bus into a utility pole on the Herstelling Public Road. ‘A’ Division Commander, Assistant Commissioner Clifton Hicken said there were no reported deaths. He said a woman sustained serious injury to one of her legs.